The protracted Sino-Japanese War (1937-45) is the least studied major theater of the Second World War, a matter which is addressed in The Battle For China. 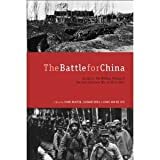 As its subtitle states, The Battle For China is actually a collection of twenty essays by various leading historians, rather than a single-volume history on the war. Given that, this landmark work represents the nearest thing to a comprehensive English-language operational history on this poorly-covered theater of the Second World War. In most military histories the Sino-Japanese War, with its horrific death toll second only to the titanic duel between Nazi Germany and Soviet Russia, is often mentioned as a precursor, and takes a distant backseat to the clash between Japan and the United States in the Pacific theater from 1941-45. Previous English one volume treatments of the Sino-Japanese War usually touched upon the general political turmoil that wracked war-torn China, the ordeal of her civilians in the face of enemy brutality, and her tumultuous relations with the Western allies. Descriptions of combat operations were limited, and did not elaborate upon how Imperial Japan initially prevailed in China beyond their technological and organizational superiority over the larger but fractured Chinese military led by Chiang Kai-shek, or ended up in a quagmire by 1939 with escalation to war against the Western powers as their only recourse. These works often relied upon either biased official histories produced by the Nationalist Chinese government prior to the 1970’s, or eyewitness accounts of limited perspective by contemporary Western observers, journalists and participants (Carlson, Snow, Dorn, etc.). In light of the recent native-language histories and materials now available in Japan and mainland China as well as Taiwan, an update is long overdue. The book is divided into six parts. Part One provides an overview of the war on the strategic level. The major land campaigns are well summarized, especially the limited ground operations after 1941 culminating in Japan's devastating “Ichi-go” offensive and subsequent Chinese counterattacks both in China-proper and through Burma. The prewar military and personnel organization of both armies is concisely addressed in Part Two. Parts Three through Five analyze the initial, intermediate and final phases of the war. Here a series of individual essays describe various dimensions of how both sides waged war in China, from strategic issues including Allied involvement, down to the tactical level. The two chapters on air operations go beyond the typical “Flying Tiger”-centric accounts, covering not only the pre-1941 period but also Japan's ultimately inadequate strategic bombing effort against China’s cities. Finally in Part Six, three essays discuss the relevance of the Sino-Japanese War in the course of WW II history. The most significant and anticipated feature in The Battle For China are the essays describing the operations of Imperial Japanese forces which seem to dominate this volume, based upon recently published Japanese-language histories and materials. This is supplemented by the latest research from mainland-Chinese sources on Chiang’s Nationalists as well as Mao Zedong’s Communist forces. Noteworthy additions include one chapter on the complex guerrilla war, explaining not only how motley Communist insurgents grew in strength, but also how considerable numbers of pro-Nationalist irregulars failed to make a similar impact. Another chapter presents a case-study of one Japanese Army division’s struggle to maintain “combat motivation,” providing a human dimension to what would otherwise be a clinical history. If there is a major flaw in this volume, it is the lack of a similar in-depth unit history covering comparable Chinese forces. The Battle For China thus represents a comprehensive, if still-incomplete stand alone history that sheds new light on the Sino-Japanese War, and a great step forward in covering this largely unknown major theater of the Second World War. Our Reviewer: Ed Chen is a graduate student in history in New York City. Long a member of the New York Military Affairs Symposium, and current serves as NYMAS treasurer.